Poor air quality is a topic that is dominating minds and discourse throughout the country, especially now that winter is around the corner. 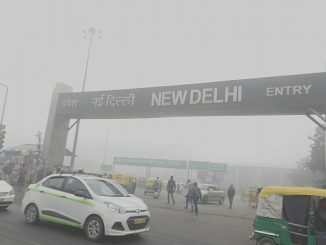 To people with experiences from cleaner environments abroad, the contrast in air quality becomes ever more palpable and stark upon returning to India. To examine the possibilities of breathing healthy while on a visit to the city of Raipur, we decided to try out an air purifier from a company called Smart Air. 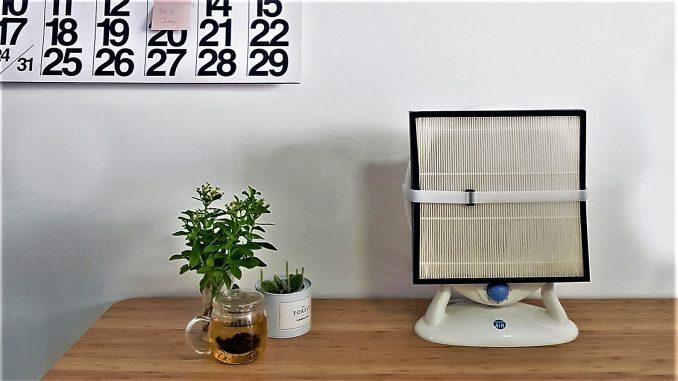 The DIY Air Purifier from Smart Air appealed to us with its focus on affordability, simplicity and functionality. However, there are of course many air purifiers in the market that are equally likely to improve the quality of indoor air. An air purifier is a very straightforward device which in essence only consists of a fan and a filter. The stronger the fan the more air is pushed through the filter, and the better the filter the more particles will be trapped rather than entering your lungs. Since the air filter is essentially a fan fitted with a filter it also behaves like a fan in several aspects. It requires about as much power as, and makes noise, like a fan. While a strong engine is required for the fan (measured in flow rate, the amount of air which passes through the fan), the main quality criteria for the filter is whether it conforms to the HEPA (High Efficiency Particulate Air) standard. To try out an air purifier called DIY 1.1 Air Purifier we ran a little experiment in our hotel rooms in Raipur over two consecutive October nights. Installing the air purifier is very straightforward and only requires the filter to be strapped with Velcro to the fan, and the plug point to go into the socket. To verify the result, we used Atmos PM2.5 monitors to track the pollution trend, with an additional monitor on in the next room to see what happened to the air quality overnight without a filter. On the first evening, when we turned on the air purifier the PM2.5 level was around 50 in the room. This is above the national limit of 40 micrograms/m3 but is hardly surprising given the much higher levels which are frequently reported. It was also much in line with what the outside air quality was like at the time according to city level Atmos monitors. Within the first hour, the monitor in the room showed a relatively rapid improvement to reach 30. Over the second hour the room went down further to 20. This must be considered quite decent but was perhaps not as good enough if the aim was to bring it below the WHO recommended level of 10 micrograms/m3. Meanwhile the monitor in the next door room remained around 50. As the night progressed the two rooms kept a 30 unit difference in particle levels. On the second night that the air purifier was running, the air quality outside had improved to begin with, thanks to an unexpected spell of rain. The PM2.5 levels, according to monitors across the city, were already down to about 20. In the room with the air purifier, pollution levels initially remained higher than the outside air at 24. This is because dirty air takes a while to ventilate even as outside rain brings the overall levels down. Soon enough, the air purifier continued to show results indoors. As the PM2.5 levels for outdoor air stayed around 20, the indoor air levels went below 10 and stayed at this low level, within WHO recommendations throughout the night. The next-door room recorded levels similar to the outdoor air — between 10 and 20 throughout the night. This brief test thus seems to indicate the possibilities of access to better air for our lungs indoors by using an air purifier. The upfront cost of a Smart Air purifier is about 4,000 rupees including one HEPA filter. This filter will last for about 3 months depending on the air quality, after which it needs to be replaced at a cost of 1,300 rupees. Replacement filters can be easily purchased via the Smart Air website. After the one-time purchase of the fan, the running cost for clean air in one room, is thus about 500 rupees per month. However, it must be pointed out here that the authors are not affiliated in any way with Smart Air Filter. Depending on budget any high quality air filter following the HEPA standard should be able to assure significantly cleaner indoor air. We have witnessed that other filters also bring down PM 2.5 levels, as measured on the Atmos monitor. It is a sad state of affairs that ordinary citizens have to invest in air cleaners. 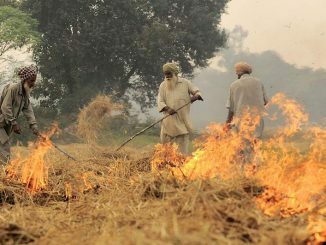 But it is clear that across the country any meaningful clean-up of the air will take years if not decades. It therefore looks to be high time for investment in an air filter at home. In our lives, there are many compulsions; such as of work and everyday commute that may force us to expose ourselves to poor air. However, we may still be able to control aspects of our environment for some hours each day – for instance, improving the air in our rooms as we sleep. An air purifier will give you and your family better sleep. And then, perhaps, you can even spend a little bit of that extra energy you gain (from better sleep) to get your local authorities to ensure your legally mandated clean air!